Ce document au format PDF 1.2 a été généré par / Acrobat Distiller 3.0 for Power Macintosh, et a été envoyé sur fichier-pdf.fr le 24/03/2014 à 17:03, depuis l'adresse IP 78.124.x.x. La présente page de téléchargement du fichier a été vue 2811 fois. Type . . . . . . . . . . . . . . . . . . . . . . . . . . . . . . . . . . . . . . . . . . . . . . . . . . . .
Saloon and Estate models . . . . . . . . . . . . . . . . . . . . . . . . . . . . . . . . .
Van models . . . . . . . . . . . . . . . . . . . . . . . . . . . . . . . . . . . . . . . . . . . . .
Hub bearing grease . . . . . . . . . . . . . . . . . . . . . . . . . . . . . . . . . . . . . . . .
Oil . . . . . . . . . . . . . . . . . . . . . . . . . . . . . . . . . . . . . . . . . . . . . . . . . .
Semi-fluid grease . . . . . . . . . . . . . . . . . . . . . . . . . . . . . . . . . . . . . .
Pre-May 1983 models . . . . . . . . . . . . . . . . . . . . . . . . . . . . . . . . . . .
Post-May 1983 models . . . . . . . . . . . . . . . . . . . . . . . . . . . . . . . . . . Checking tolerance . . . . . . . . . . . . . . . . . . . . . . . . . . . . . . . . . . . . . Adjust to . . . . . . . . . . . . . . . . . . . . . . . . . . . . . . . . . . . . . . . . . . . . .
Steel wheels . . . . . . . . . . . . . . . . . . . . . . . . . . . . . . . . . . . . . . . . . . . . Alloy wheels . . . . . . . . . . . . . . . . . . . . . . . . . . . . . . . . . . . . . . . . . . . .
Driveshaft retaining nut (threads lightly greased) . . . . . . . . . . . . . . . . . .
Lower arm mounting pivot bolt . . . . . . . . . . . . . . . . . . . . . . . . . . . . . . . .
Lower arm balljoint pinch-bolt . . . . . . . . . . . . . . . . . . . . . . . . . . . . . . . . Brake caliper anchor bracket mounting bolts . . . . . . . . . . . . . . . . . . . . . Suspension strut to hub carrier . . . . . . . . . . . . . . . . . . . . . . . . . . . . . . .
Tie-bar to lower arm (pre-1983 1.1 litre models) . . . . . . . . . . . . . . . . . .
Tie-bar to mounting bracket (pre-1983 1.1 litre models) . . . . . . . . . . . .
Anti-roll bar to lower arm . . . . . . . . . . . . . . . . . . . . . . . . . . . . . . . . . . . .
Anti-roll bar clamp nuts and bolts . . . . . . . . . . . . . . . . . . . . . . . . . . . . .
Tie-bar to lower arm (1985 RS Turbo models) . . . . . . . . . . . . . . . . . . . .
Tie-bar-to-anti-roll bar clamp (1985 RS Turbo models) . . . . . . . . . . . . .
Tie-bar front pivot nut (1985 RS Turbo models) . . . . . . . . . . . . . . . . . . . Suspension strut top mounting to body (pre-May 1983 models) . . . . . . Suspension strut-to-body retaining nut (May 1983 models onward) . . . Suspension strut top mounting piston rod nut . . . . . . . . . . . . . . . . . . . .
Lower arm inboard pivot bolt . . . . . . . . . . . . . . . . . . . . . . . . . . . . . . . . .
Lower arm-to-stub axle carrier through-bolt . . . . . . . . . . . . . . . . . . . . . Shock absorber top mounting nut . . . . . . . . . . . . . . . . . . . . . . . . . . . . . Shock absorber to stub axle carrier . . . . . . . . . . . . . . . . . . . . . . . . . . . .
Tie-bar front mounting pivot bolt . . . . . . . . . . . . . . . . . . . . . . . . . . . . . .
Tie-bar-to-stub axle carrier nut . . . . . . . . . . . . . . . . . . . . . . . . . . . . . . . . Brake backplate to stub axle carrier . . . . . . . . . . . . . . . . . . . . . . . . . . . .
Roadspring U-bolt nuts . . . . . . . . . . . . . . . . . . . . . . . . . . . . . . . . . . . . .
Roadspring shackle nuts . . . . . . . . . . . . . . . . . . . . . . . . . . . . . . . . . . . .
Roadspring eye bolt nuts . . . . . . . . . . . . . . . . . . . . . . . . . . . . . . . . . . . . Shock absorber top mounting bracket to body . . . . . . . . . . . . . . . . . . . Shock absorber to top mounting bracket . . . . . . . . . . . . . . . . . . . . . . . . Brake backplate to stub axle . . . . . . . . . . . . . . . . . . . . . . . . . . . . . . . . . Steering gear to bulkhead bolts . . . . . . . . . . . . . . . . . . . . . . . . . . . . . . .
Tie-rod outer balljoint to steering arm . . . . . . . . . . . . . . . . . . . . . . . . . .
Tie-rod outer balljoint-to-tie-rod locknut . . . . . . . . . . . . . . . . . . . . . . . . Steering column shaft coupling pinch-bolt . . . . . . . . . . . . . . . . . . . . . . . Steering wheel nut . . . . . . . . . . . . . . . . . . . . . . . . . . . . . . . . . . . . . . . . . Rack slipper cover plate bolts (pre-May 1983 models) . . . . . . . . . . . . .
Pinion bearing cover plate bolts (pre-May 1983 models) . . . . . . . . . . . . Rack slipper plug (post-May 1983 models) . . . . . . . . . . . . . . . . . . . . . .
Tie-rod inner balljoint to rack . . . . . . . . . . . . . . . . . . . . . . . . . . . . . . . . .
Roadwheel bolts (all models) . . . . . . . . . . . . . . . . . . . . . . . . . . . . . . . . .
steel lower suspension arms is by a tie-bar. lower arms via the balljoints (see illustration). steering shaft containing two universal joints. balljoint split-pin must be used on refitting. caliper anchor bracket to the hub carrier. from a convenient place under the wheel arch. brake disc from the hub. using a balljoint separator tool. carrier to the base of the suspension strut. horizontal then withdraw the hub carrier. the groove in the hub carrier. 17 Prise out the inner and outer oil seals. 18 Lift out the bearings. tracks seating correctly during assembly. plenty into the spaces between the rollers. side in a similar way. position using a block of wood. should be to the rear. torque and secure with a new split pin. torque and refit the wheel trim. the nut hand tight at this stage. on stands (see “Jacking and Vehicle Support”). the arm from under the car. securing the lower arm at its inboard end. and lower arm balljoint to the lower arm. it from under the car. the same way as described in Section 3.
right-hand side of the car. facing away from the bushes. of the car on its roadwheels. tabs to lock the bolts after tightening. head towards the rear of the car. the forged type suspension lower arm. washers and the bushes (see illustration). unscrewed by turning it clockwise. arms and remove it from under the car. washer from each end of the anti-roll bar. washer and the rubber insulator. will be required for this purpose. 7 Refitting the tie-bar is a reversal of removal. of the bolt must face the rear of the car. all are of the same type. 10 Undo the nut and bolt and remove the tiebar-to-anti-roll bar clamp. and remove the bar from under the car. the basic setting as shown (see illustration). strut to the hub carrier (see illustration). cover then unscrew the strut retaining nut. mm Allen key (see illustrations). 6 Clean away external dirt and mud. components are not generally available. Allen key to hold the rod still. 7.4b Removing the nut cover . . .
bearings. Slight movement is essential. time rotating the brake drum in an anticlockwise direction. tighten it only finger tight. over the end of the stub axle. 8 Tap the dust cap into position. 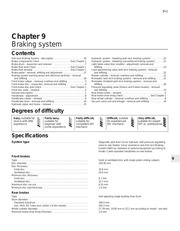 9 Recheck the play as described in paragraph 2.
brake drum from the hub. between the inner and outer bearings. not to catch the oil seal lips. thrustwasher and screw on the nut. 16 Adjust the bearings (Section 8). the shaped parts of the spring seats. assembly of the individual components. sections of the spring seatings. from under the wheel arch. 5 Take off the cap and insulator. mounting in a vice so that the unit is vertical. renewal, as will evidence of leakage of fluid. similar way to that described for testing. body and withdraw the unit (see illustration). mounting bracket from the shock absorber. 5 Proceed as described in Section 10.
must be returned to their original locations. strict sequence for refitting (see illustration). placing a jack beneath the spring seating. inboard pivot bolt (see illustration). remove the spring and insulator pad. members (see “Jacking and Vehicle Support”). Support the axle tube using a jack or stands. the roadspring and pull the spring downward. bolt and nut (see illustration). 5 Remove the spring from under the vehicle. light laden valve as described in Chapter 9.
the spring and insulator pad. 7 Withdraw the lower arm from the car. loss and the ingress of dirt. retaining bolts and withdraw the backplate. excessively then it must be renewed. and standing on its roadwheels. the hub and brake drum are refitted. Support”). Remove the rear roadwheels. and hose ends after removal. 6 Undo the axle-to-roadspring retaining Ubolt nuts and remove the U-bolts. and bush from the axle tube. 8 Withdraw the axle from under the vehicle. carefully noting the relative fixing locations. tank on its support (see illustration). checking on optical alignment equipment. leakage from the bellows, renew them. illustration). This will ensure correct toesetting on reassembly. from the balljoint taper pin. or possibly be damaged on fitting. lubricant to be removed from that end, too. the inner end of the bellows. 15 Screw the locknut into position on the tierod, followed by the outer tie-rod balljoint. insert a new split pin to secure. or by your Ford dealer. them as described in Section 20.
threads of the tie-rod and apply grease to them. precautions to avoid damage to the finish. 6 Release the tie-rod balljoint locknuts. angular error, turn each tie-rod through 30°. retaining nut to the specified torque. alignment due to lack of fine adjustment. 2 It is therefore acceptable to adjust the tierods to give unequal lengths. as possible on its shaft. the shear-head bolt must be drilled out. column by extracting the fixing screws. Disconnect the battery earth lead. the contact plate (see illustrations). 2 Insert the ignition key and turn it to position I.
retaining nut using a socket and extension. 4 Withdraw the steering wheel from the shaft. screw and position the lever to one side. 4 Disconnect the steering column clamps. the upper one is of stud and nut design. steering wheel rests on the seat cushion. the top end of the steering shaft (where fitted). 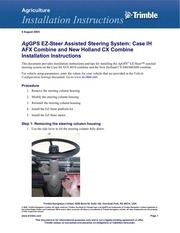 of the steering column (see illustrations). part of the facia (see illustration). securing bolt until its head breaks off. 1 Disconnect the battery negative terminal. shaft of the rack-and-pinion steering gear. a pre-1986 model . . .
base of the steering shaft. 32 Reconnect the battery negative terminal. be levered out of its seat. collapsible section of the column tube. bearing seat when the shaft is installed. the in-car attitude (where fitted). with the pegs on the tube. 24 Reconnect the wiring harness multi-plug. 26 Reconnect the bonnet release lever. 27 Fit the column shrouds. and realign it (see also Section 23). 1 Set the front roadwheels in the straightahead position. arms using a suitable separator tool. 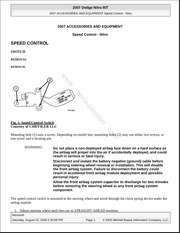 9 Make sure that the steering gear is centred. turns required to rotate it to the opposite lock. the number of turns just counted. bolts with their lockplate tabs. wheel alignment, as described in Section 27.
to good steering and for even tyre wear. the steering linkage is in good order. tilted outwards at the top from the vertical. rear of the vehicle at its upper end. in the bushes at the attachment points. the balljoint assembly (refer to Section 23). and locknut at one end. and turn the tie-rods by an equal amount. bellows will twist as the tie-rod is rotated. 10 Finally, tighten the bellows clamps. 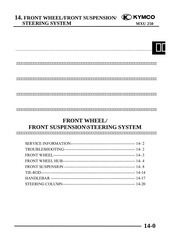 11 For rear wheel alignment refer to Section 19. Ce fichier a été mis en ligne par un utilisateur du site. Identifiant unique du document: 00231366.